Aloha Festivals celebrate Hawaii Culture Throughout September. 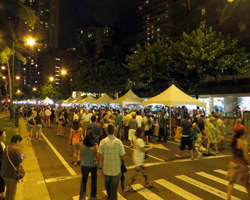 Waikiki's Aloha Festivals Blow Out the Summer! If you’re here in September, looking for free things to do in Waikiki, the Aloha Festivals could be exactly the right mix of Hawaii culture, Hawaii history, and Waikiki luau to take your Hawaii vacation fun to the next level. Consisting primarily of a Hawaiian royal court investiture and opening ceremony, a hoolaulea (block party), and floral parade (plus some random affiliated activities), these Hawaii special events usually span a three week period within the month. Billed as the largest celebration of Hawaii culture in the nation (and probably the world), the Aloha Festivals were initially established just one year after the end of World War II. These Hawaii annual events were originally called Aloha Week, and they were to be a time for perpetuating Hawaiian music, hula, traditions and heritage. These Hawaii festivals then grew in popularity and spread throughout the islands. The name change came in 1991, and I really can’t recall the reason why. Maybe it sounded more festive. Check out my vintage Hawaii Aloha Week advertisement. The celebration begins on a Thursday evening at the Royal Hawaiian Shopping Center. 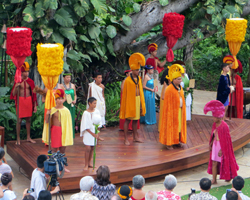 That’s where the honorary Hawaiian royal court, in authentic ancient Hawaiian royal costumes, is inaugurated at a special opening ceremony. The event often begins with a performance by the Royal Hawaiian Band. Then the ceremonial court is announced. The band is consistently good no matter where they play, and the investiture is quite beautiful – especially if you’re seeing it for the first time. Beyond that, there’s not much else going on; so enjoy it for an hour and get on with the rest of your family vacation in Hawaii. The next major Aloha Festivals event is the hoolaulea, from 7pm to 10pm on the Saturday one and a half weeks later. This block party is one of the biggest in Hawaii – stretching along Kalakaua Avenue from Lewers Street to approximately Uluniu Avenue. 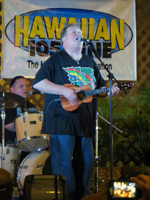 There are five stages featuring live performances by several big-name local entertainers. There are usually a couple dozen food vendors and close to twice as many craft vendors. Like all of these events, admission is free, but you’ll have to pay for your food and souvenirs. During my most-recent time at this event, I had a spicy tuna bowl, which was quite tasty; and my wife and kids thoroughly enjoyed splitting what looked like it might be the world’s largest grilled steak and shrimp plate! The last major event of the Aloha Festivals in Waikiki is the floral parade, which falls on the Saturday one week after the hoolaulea. This procession of floats, marching bands, V.I.P.’s, and hula halau (schools) is highlighted by the Pa’u (pah-ooh) riders. 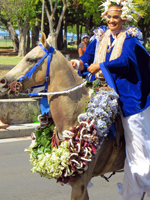 These horsemen and women – representing each of the main Hawaiian Islands – include a princess (attired in elegant nineteenth century royal dresses and robes) and her color-coordinated mounted attendants. Add some elegant floral garlands to both horse and rider, and overall effect is uniquely picturesque. The parade starts at approximately 9am at Ala Moana Beach Park and travels along Ala Moana Boulevard to Kalakaua Avenue until it ends at Kapiolani Park. Because the dates change from year to year, I recommend that you check the Aloha Festivals Schedule of Events before you arrive (link opens a new window/tab). I wouldn’t plan my entire vacation around this one event, because there are other similar Oahu festivals and events almost every month (see my Hawaii event calendar). But if you were going to be here at the right time of year, you might as well take advantage of some free Hawaii fun.